ISR-affiliated Associate Professor Dave Akin (AE) and his graduate student Shane Jacobs are developing a morphing upper torso spacesuit that can contract using pneumatic artificial muscles to make donning the suit easier and ensure a perfect fit. Jacob recently presented research on the new suit at the International Astronautical Congress in Daejong, South Korea. The suit is being developed by the Space Systems Laboratory, which Akin directs, and ILC Dover LP, a company specializing in engineering softgoods products. 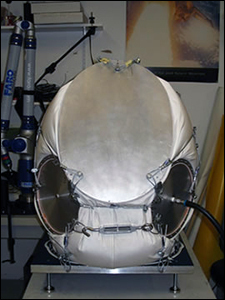 It is being tested in the university's neutral buoyancy tank. The morphing upper torso’s light weight, resizability, and dynamic reconfigurability makes it appealing as a candidate for a next-generation planetary exploration suit. Jacobs noted that the suit should be less unwieldy than today's suits and allow astronauts to be more efficient, both during spacewalks and in planetary exploration. "Our research shows that of the physical work astronauts actually do on a spacewalk, only one-quarter of it is mission related. The rest goes into just moving the spacesuit around," says Akin. Robotic actuators are also being applied to the suit's gloves. The suit also includes new visual aids in the form of stereo LCD spectacles and an in-helmet video screen. The LCD glasses can show augmented reality imagery. See news stories about the suit online at New Scientist and Asian News International.